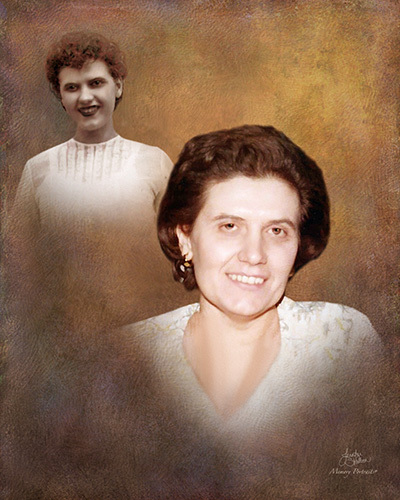 Obituary for Dorothy M. (Buban) Hodnik | Savolskis - Wasik - Glenn Funeral Home, Inc.
Of Munhall, on April 9, 2019, age 86. Beloved wife of 64 years to James F. Hodnik, Sr.; loving mother of William Hodnik, Donna (Bob) Wolf, Carolyn (Craig) Zender, James F. Hodnik, Jr., and the late Michael (wife, Paula, survives) Hodnik and Joyce Barefoot; sister of the late John and Elmer Buban; grandmother of Thomas, Kelly and Erin Barefoot, Melissa and Marty Zender; also survived by nieces and nephews. Friends received Savolskis-Wasik-Glenn Funeral Home, Inc., 3501 Main Street, Munhall, Wednesday 2 to 4 and 6 to 8 pm. Funeral Mass, Thursday 10:00 am, St. Therese Church, Munhall. In lieu of flowers, memorial contributions may be made to St. Therese Church.